i tried to play with map files on my Android version. that's was easy like old times. some textures from VC with same names was rendered on model. PS when i've created separate file for this game skipped it, but when i've added it to the original nbeach.ide / ipl it works fine. 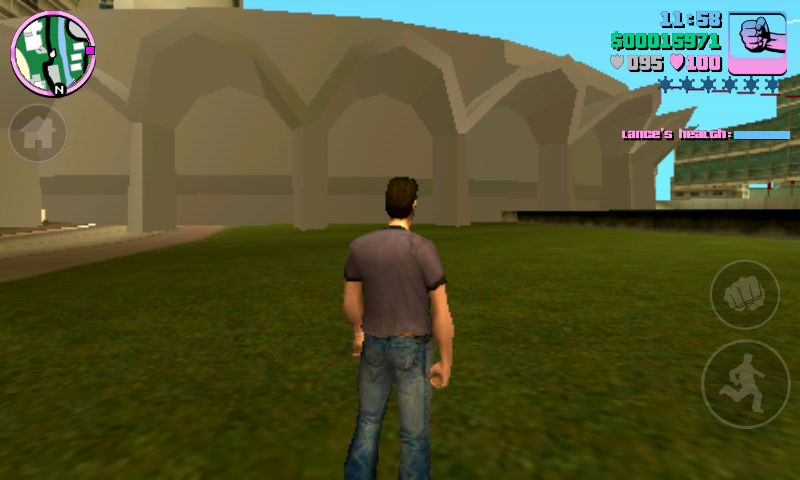 model was converted and added into gta3.img. has any one had some luck with modding the android version? if yes how did you do that because when I change some thing the game stops working? Wanna give Vice City the finger...I mean fingers? Edit: As pointed out by City_Poke912, the offset also controls other Xbox features like the HD cars. @oinkoink Awesome stuff man, keep it up! @nkjellman I'm pretty sure the debug menu requires both the SCM and the EXE to have it switched on. Oh man, thanks! Can you find offset for XBOS cars? It must be in set file, because when I delete set file, it generate new file with XBOX cars. Edit. First post updated with yours fingers offset and enabling debug mode. If .etc is uncompressed, so how can I open it? My phone support .etc textures (Adreno). also compression is not a problem. DXT version is just the same, first 8 bytes is not a raster data too. and gta3img cache data is different too. I'm sorry that I am asking here in this thread, but it's better than creating a new one so, can somebody please give me a download link with all missions passed, because I crash after the cutscenes in "Keep your friends close". I'm with the Android version. Oh man, that would rock. Is VC released for Android yet? It's out, but not officialy. I have no clue what that TXD program is, where can I find it? So for debug mode could you upload the scm that allows us to access it? Well screw this crap, someone else has already cracked the texture format, how about sharing the details? I'm going nuts here wondering where I'm going wrong! So it seems that the bare textures are the same, but the way they are packaged together is different? I'm trying the method outlined above but it's just not f*cking working! PVRTexTool reprots back "Value Too SmalL" and then f*cking crashes, piece of sh*t program. Textures are from PC, with detail map. This tool can open DXT textures and only HUD and menu textures can be opened. Have you opened them? I want to open them myself. Anyway to add detail map to PC? PS: Detail map might be useful for VC to IV conversions. CP, if you know how to open them, could you tell me? Because in all honesty, I'm at a wall here, and I'm more pissed off at the fact I know there's a way around it, I'm just not seeing it now. I'm sick to death of PVRTexTool, such a sh*tty damn program. I don't even know where to get this tool. Nick send me that tool, it can open menu and hud.dat, other files have artifacts on textures. Can you forward it to me then? Just opening SOMETHING would be better than what I'm currently doing where everything is broken and artifacted. Me too. There are a few things I want to try with it. We're not "allowed" it apparently just yet. 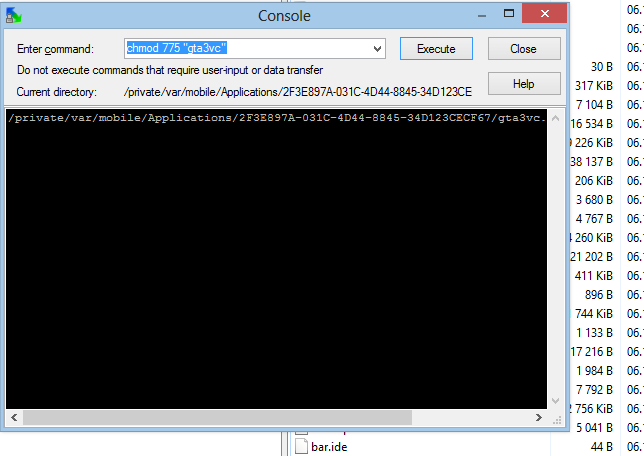 1) Setup a connection with your iDevice with WinSCP, tutorial here or here. 3) Copy downloaded gta3vc to [gta3vc.app] folder. 5)Respring, to avoid crash, and start the game. Close and start the game. Crashed the first time I launched the game after installing that. Had to respring my device and then it started working. Thanks, added to description. I thought respring was necessary after ldone "gta3vc" -s, but apparently not. UPD. I guess i managed fading. Now it's completely removed. UPD2. I disabled one function, which is renders some effects, and i think performance on my 3GS became a little better. disabled_effects.zip if anyone want to try. Which function and effects? Are they ones you can already turn off by the set file?